Line a deep muffin tin with 12 paper cases. Measure the eggs. Caster sugar, butter, flour, baking powder, milk and zest into a mixing bowl. Beat together using an electric hand whisk. Stir in the cranberries and spoon into the cases. Bake for 18 to 20 minutes until well risen and lightly golden. Leave to cool on a wire rack. To make the icing, sieve the icing sugar into the soft butter, beat together until smooth. Add the cocoa powder and the pinch of salt and mix until smooth. Chill in the fridge for 20 minutes to firm up a little. Spread the icing over the cold cupcakes using a small spatula. Cut lengths of Curly Wurly Chocolate Bars for the antlers. 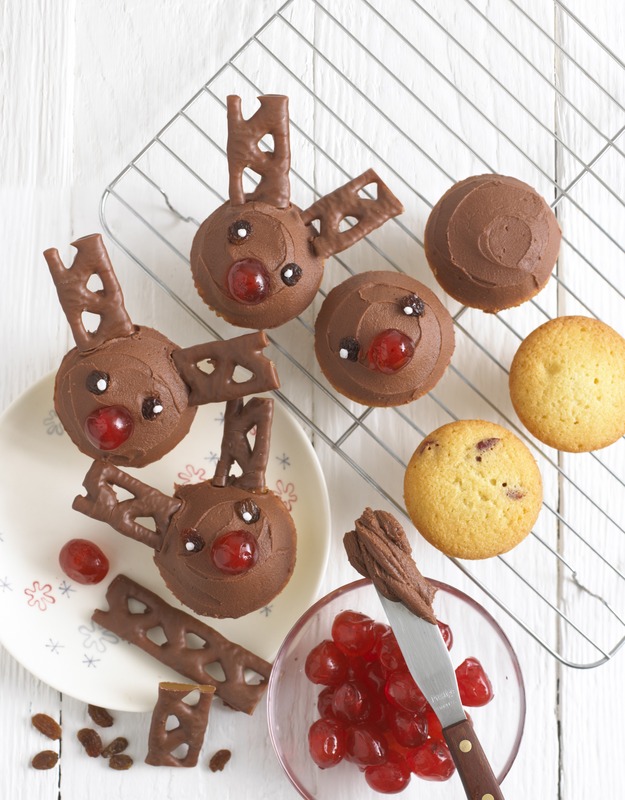 Push the antlers into the cupcakes. Place a cherry in the centre of each cake to make a nose. Put 2 sultanas on each cake to make the eyes and add a blob of white writing icing in the centre. Chill until firm. Previous article Joie’s Guide to Finding the Perfect Pushchair!